Spring is here, and that means fun is in the air here at at Kidstown Learning Center. Our Lake Worth kids daycare facility has a full slate of themes and activities on deck for April, including an Earth Day event and our annual picture day! 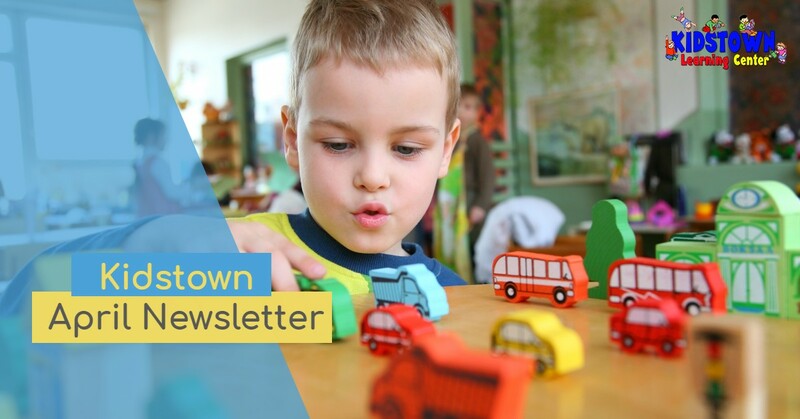 Take a look at our monthly newsletter below (in both English and Spanish) to learn more about all of the happenings at Kidstown this month. And keep in mind that summer is right around the corner! If you’re still looking for a summer camp for your child, consider our very own Lake Worth summer daycare program. Contact Kidstown Learning Center today to book your child’s place to learn and grow! The theme of the month for April is “sharing.” At Kidstown Learning Center, we believe that sharing allows kids to experience the joy of giving to others. It’s realizing how wonderful it is to give without expecting anything in return. We encourage all of our students to learn the value of sharing all month and every day. Compartir es experimentar el gusto de dar a otros. Es darse cuenta que tan maravilloso es dar sin esperar recibir nada a cambio. For our annual Earth Day event, we will be planting a tree and learning how to take care of nature. Parents, please support your child’s class with what is required in order to have a great experience and success with these activities, which will take place on Friday, April 20. Para esta ocasión estaremos plantando un árbol y aprenderemos a cuidar la naturaleza. Padres, por favor apoyen a las maestras de sus hijos en lo que se necesiten para que esta actividad que será realizada el 20 de Abril. This month, parents can help their children prepare for our suggested activity by helping their child collect pictures of all types of vehicles. Pictures can be from newspapers, books, magazines, and any pictures you might have. Have your child bring the photos to class for a group project. Ayude a su hijo/a colectar fotos de medios de transporte y tráigalos a la clase para hacer un proyecto en grupo. April 16 through 20 is known as “National Week of the Young Child.” During this week, our Lake Worth kids daycare classes will be having their own celebrations and special activities. Please assist your child’s teacher in order to help make this week a very special one for our very special young children. Del 16 al 20 de abril es La semana nacional del niño pequeño. Durante esta semana cada clase estará celebrando con actividades especiales. Por favor asista a las maestras de su hijo en lo que necesiten para hacer esta celebración muy especial para nuestros niños. Say, “Cheese!” This year, our picture days will be held on April 5 and April 6. Posters will be placed around the school to announce the picture day for each glass. Graduation pictures will also be taken for the Pre-K and VPK classes at this time. Las fotos van a ser tomadas el 5 y 6 de Abril. Tenemos carteles puestos alrededor del centro para anunciar cuando le corresponde a cada clase. Fotos de graduación serán tomadas a los niños de Pre-k y VPK. Kidstown Learning Center is your child’s place to learn and grow. From infants to toddlers to preschool students and VPK students, we are happy to help children of any age to develop social skills, learn basic education skills, and receive the attention and nurturing they deserve. Learn more about our Lake Worth kids daycare and give us a call today to learn how to enroll your child in any one of our classes or programs.